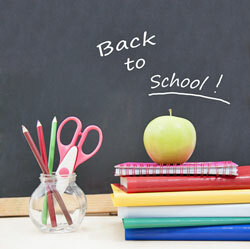 The school year is a clean slate, for students as well as for parents. If you want to help your student have a successful year, there are some things you can do to get things off on the right foot. The specifics of how you might implement these suggestions will differ depending on the age of your student, and if your student has gone away to college, you probably will have to settle mainly for encouraging him or her from afar. Provide a quiet, dedicated study space. While occasionally there is a student who actually can study in front of the TV, most students only think they can. Make sure your student has an age-appropriate dedicated study space. For younger scholars, this can be a corner of the kitchen table where they can work under your guidance. Older students probably need their own space, and their own computer. In any case, though, it should be quiet, free of distractions and well-lit. Make sure your student has the necessary supplies. These can range from pencils – regular and colorful – and a pencil sharpener to a computer, printer and advanced calculator. It is always a good idea to have a ready supply of things like poster board, construction paper, markers and glue. You don’t want to choose between letting an assignment slide or running out after dinner for supplies your student needs to complete a project. Provide good nutrition. The brain needs nourishment in order to work hard, so make sure there is plenty of healthy food available. Encourage your student to get enough sleep. Many experts believe that students, especially teens, don’t get enough sleep – which can have a negative impact on their performance. In general, teens tend to stay up later, which can make getting up early less than pleasant for everyone. Be alert to problems. If your usually chatty student starts to clam up, that could mean that there is a problem. If a student who usually shares notes from the teacher or project or test grades suddenly seems to have nothing to share, that could be a problem. Not all problems are serious, and even kids are entitled to have a bad day once in a while. But watch for significant changes in behavior. Let your student know that you always have his or her back. This is not the same as always assuming the student is right and the teacher is wrong. But encourage your student always to do his or her best, and offer to provide tutoring or other help if your student seems to be falling off course. Don’t forget to have fun. For some families, school can become a continuing source of conflict and stress, which does little to encourage a love of learning. Make sure you do non-school things together. Just hang out and have fun, so you both remember why you love each other. And as a bonus, relaxing together might make your student more willing to talk to you about school.